A fascination with Baja California and its missions resulted in a self-published book called RAMBLING THROUGH BAJA CALIFORNIA. Its author/artist is Anthony Quartuccio. The sketches and paintings reproduced in the book are accompanied by hand-lettered text which adds a personal touch, allowing the artist to share his experiences with the reader. With notebook, sketch pad, and paints, Mr. Quartuccio has traveled for many years to Baja California to capture the scenic landscapes and historic missions. For him, Baja California holds a mystery, challenge and beauty which strikes a chord, "A certain exhilaration overwhelms me and I experience a fantastic freedom of spirit .... a time of joy, tranquility and fulfillment." RAMBLING THROUGH BAJA CALIFORNIA is filled with 120 pages of color and black and white illustrations. 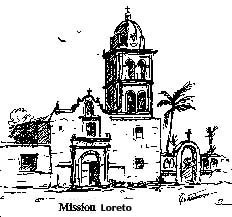 Included among the sketches and paintings are those of the Mission at Loreto and Mission San Javier. 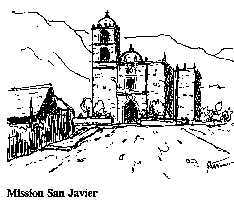 "The first time in Baja California," he said, "I painted Mission San Javier for three days, from all different angles and lighting. I just couldn't get away from there. I selected a spot under a tree near the mission to do a painting and it seemed like the entire town came to watch, staring at the brushes and colors, wanting to be part of the canvas. Sundown came and the deep shadows of the canyon walls enveloped the valley, tranquil, yet so lonely! San Javier is truly a Jewel." Anthony Quartuccio was born in Sicily and came to the United States when he was seven years old. He spent most of his life in the Santa Clara Valley. He is now retired and resides in Paso Robles with his wife Maria Baro Quartuccio. He continues to draw and paint.